Posted on 15, December 2016 by EuropaWire PR Editors | This entry was posted in Automotive, Germany, Technology, Transportation & Logistics, Travel and tagged Advanced driver assistance systems, automotive world digitalization, CES 2017, Continental, Helmut Matschi, holistic connectivity, security solutions. Bookmark the permalink. Las Vegas, Nevada, U.S.A., 15-Dec-2016 — /EuropaWire/ — Advanced driver assistance systems, security solutions, concepts for cleaner drives, and holistic connectivity: The list of pioneering products from Continental is expanding as the automotive industry continues its rapid shift towards software and mobility services. To demonstrate its interpretation of the digitalization of the automotive world, the international technology company will be showcasing a selection of products and services at the Consumer Electronics Show (CES) on January 5 – 8 in Las Vegas. “The entire automotive industry is undergoing a revolution and we at Continental are playing an active role in shaping it. On the basis of our solid expertise in systems integration and our years of experience in the field of vehicle connectivity, we are constantly adapting our products in line with the latest market trends. For example, we are developing the building blocks of new mobility solutions for our customers and helping to shape the mobility of tomorrow together. At the upcoming CES in Las Vegas, we will be showcasing the very latest solutions which will be taking us into the future,” says Helmut Matschi, member of the Executive Board at Continental and head of the Interior Division. Innovative access systems can do so much more than simply unlock car doors or start the engine. Through the combination of the keyless entry and start system PASE (Passive Start and Entry) and biometric elements, Continental offers enhanced security and real personalization. To start the engine, for example, it might no longer be sufficient simply to have the right key inside the vehicle, depending on how the automotive manufacturer’s system is configured. Only once the driver has confirmed his identity via a fingerprint sensor will he be able to start the engine. This two-factor authentication system offers significantly enhanced protection against theft. In addition, an interior camera enables enhanced vehicle personalization. A face recognition feature automatically personalizes a range of vehicle settings such as the seat and mirror position, music, temperature, and navigation. Biometrics can be integrated in any intelligent system, regardless of which access technology is used in the vehicle (Bluetooth® Low Energy or Low Frequency). The new Continental cloud terminal offers maximum flexibility in the cockpit. Applications that used to be integrated directly in the head unit have now moved over to the cloud, where they are processed before being displayed on a powerful browser. This ensures that the system is always up-to-date and that new functions can be added at any time. In addition, the terminal uses HTML5 technology to develop and display the cloud applications, which not only enables platform-independent development of applications, but also allows data to be displayed on different displays with different resolutions. As a result, vehicle manufacturers can roll out the applications across different models and vehicle classes. The cloud terminal also acts as the driver’s digital assistant, analyzing the driver’s habits at different times of the day and week and, on this basis, automatically setting the entertainment program to play, the driver’s favorite radio station on the way to work in the morning. Other applications can be similarly optimized: Another convenient option: if the driver goes to the gym every Wednesday afternoon, the route to the gym is displayed automatically when the system is started. Even the standard radio can be optimized in important ways through the addition of extra cloud services and artificial intelligence systems. Continental’s service unites multiple offerings in one crowdsourcing concept designed to make the radio an intelligent system. This means that drivers can view the schedule of any station at any given time and choose exactly the station they’re in the mood for. Also, stations can automatically switch to the driver´s favorite artist. The package is rounded off by the system’s ability to provide recommendations of other, specialized radio stations based on the driver’s listening habits. Motorcyclists can already start looking forward to future seasons because, thanks to the electronic horizon (eHorizon), Continental developers are enabling not only car drivers but also motorcyclists to see around corners. The eHorizon system for two-wheelers interconnects riders, offers a shared platform to motorcyclist communities, and allows motorcyclists to share important route information. With this system, Continental is using the concept of swarm intelligence, which continuously supplies the digital map in the backend with accurate and up-to-date information. The stored data is collated in the cloud and made available to all motorcyclists. This ensures that riders are informed in advance of obstacles along their route such as road works, accidents, oil or water on the road, or traffic jams, which enhances safety not only for them but also for all other road users. Continental’s Intelligent Glass, which enables the selective and incremental shading of nearly all car windows at the touch of a button, just got smarter: Continental has added a range of new functions designed to further enhance passenger comfort. 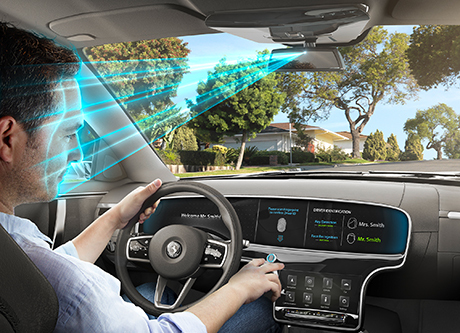 Thanks to the integration of Intelligent Glass Control in the vehicle’s electronic communication system, the glass dynamically adjusts itself to different traffic situations. For example, because the system is connected to light sensors, the glass can be tinted at exactly the point where the sun is shining on. The keyless entry and start system PASE (Passive Start and Entry) is also linked to Intelligent Glass Control, which means that the window tinting can be adjusted as the driver carrying the key approaches the car. Continental’s solution is not limited to specific types of film and is compatible with different technologies such as SPD (Suspended Particle Device), EC (Electro-Chromatic) or PDLC (Polymer Dispersed Liquid Crystal). The growing demand for functions and digital content in the cockpit means that in-vehicle display surfaces are getting bigger all the time. Fully digital instrument clusters may be ideal for flexibly displaying digital content, but they offer less design flexibility. To enable future drivers to enjoy digital content without having to stare at an old-fashioned flat media display, Continental has developed a 3D display surface featuring optically bonded, topographical elements that restores a sense of quality and design individuality to the classic display. As a central computer comprising a network of multiple heterogeneous processing units, the Assisted & Automated Driving Control Unit can play a major role in the interconnectivity of electronic chassis and safety systems, increasing the functional scope by interconnecting systems that used to operate in isolation. Because intervention decisions are centrally coordinated, simultaneous interventions in different systems harmonize perfectly with each other. For Continental, the control unit is a central element for implementing the required functional safety architecture and, at the same time, a host for the central environment descriptions and driving functions needed for automated driving. On its stand, Continental’s latest acquisition Zonar will be showcasing its portfolio of intelligent fleet management technology for goods and passenger transportation. The new ZonarConnect™ system is a permanently networked, next-generation tablet that gives operators of commercial vehicle fleets greater control over their business processes. The tablet is certified according to the Automatic On-Board Recording Device Regulation (AOBRD) and is ready for certification by the future US standard for electronic logging devices (ELD). ZonarConnect also features the patented EVIR application, the only program in existence for verified electronic vehicle inspections.